This is just another one of those article about my experience with working out how to get a language operational in my dev environment. All it really serves to do is to demonstrate there's not much to it, so it should not be a "barrier to entry" if you decide to have a look at Clojure. I am way too much a newbie with it to be offering anything actually insightful here though. Obviously that said if one's just wanting to give it a bash, there's online REPLs about the place (eg: Try Clojure) so no need to install it, but their scope will be limited, and for some reason I prefer to have stuff running locally. It goes without saying finding out how to get it installed was a matter of googling: "install clojure windows". The first link is their website ("Clojure: Quick Start"), unsurprisingly. No messing around. Not like trying to find how to install ColdFusion. Clearly install easy too (based on the instructions on that same screen shot!). Indeed it is. I simply D/Led and unzipped into C:\apps\clojure. I've got Java 8 installed btw. REPLs are cool, but I wanted to be able to write my code in files, and run 'em. Once again I had no idea what to do, but googled "clojure execute file" and the second link too me through it. But Clojure doesn't work that way. Oh, hey: I'm such a n00b with Clojure I even had to google what the file extension ought to be! Anyway, that second link was to this article: "Building, Running, and The REPL", wihch was an excellent read. It mentions "Leiningen" which seems to be the Clojure package manager du jour, and I figured I needed to get that installed too. Fortunately installation was bloody easy, and there's a Windows installer for it to boot. Back to that article, and down to the "2.1 Creating a new Clojure Project" section. I think it's pretty cool it creates it in a Git-aware way, and also includes a stub for tests. So they're encouraging TDD right from the outset. Bravo. I must check with Brad if CommandBox creates its default projects in a TestBox-ready way? It wouldn't be me if I didn't change that to "G'day World!" so I have done so. This takes a bloody age to run (about 12sec on this machine), but one needs to bear in mind Clojure is a JVM language, so it needs to crank up the JVM too. The main thing is that it works. It worked. It's still slow, but Clojure projects are a bit of overkill for a "G'day World" example. Bearing that in mind, I decided to try to use the best of both worlds: putting my code in a file, but running it as a script from within the REPL. 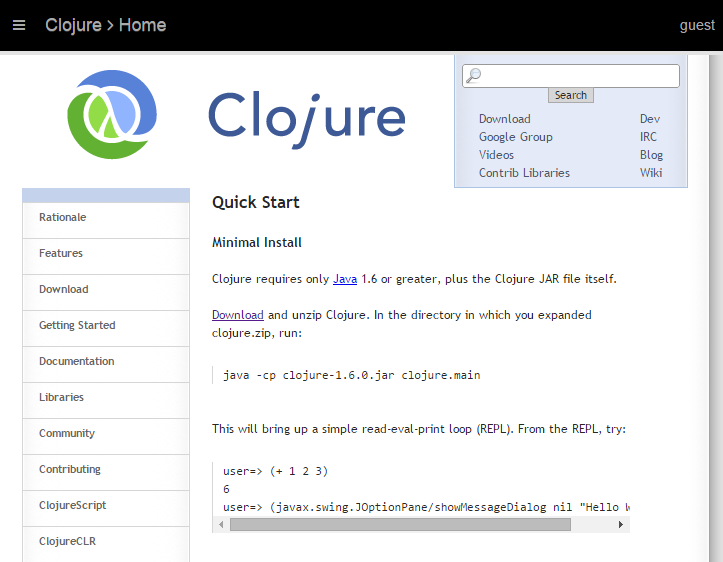 This time I googled "clojure repl load from file", and the first link (ClojureDocs: load-file) shows how to do that. The docs say: "Sequentially read and evaluate the set of forms contained in the file." And running in this environment is instant. CTRL-C works too, but it seems a bit like killing it rather than exiting it. It probably doesn't matter too much. I have not looked at any code yet beyond what's shown here, but I am all good to go to try some quiz exercises ("Something for the weekend? A wee code quiz (in CFML, PHP, anything really...)" and "Another quick code puzzle (any language)"). As per usual, I'll try to come up with my own answer before looking at anyone else's answer for the given language. I have two Clojure answers to look at for that first quiz: Charlie Griefer's one, and Sean's one. I've got a busy day tomorrow, but I'll see if I can sit back down and try some of my own Clojure code. If not tomorrow, over the coming days. I also have some PHP and some CFML code to knock together soonish too. Righto. I think I need a glass of wine, so I shall need to go buy some.